"I have found this remedy extremely useful in loss of vision due to retinal detachment and other pathologies. A case : wife of an eminent homeopathic physician suddenly became blind. On detailed examination at a specialized center no cause could be found out. The lady was non diabetic. I was requested to suggest the remedy on phone.I talked to her husband but could not elicit any significant point helpful for the prescription. I suggested Napthaline 6 to be given 3-4 times a day. 2 days later the vision started to return and she could recognize faces. Complete recovery took place in a month and is considered as a miracle even by the ophthalmologists who examined her and found no clue to treat her. Among the indications mentioned in Boericke's Materia medica are: It produces detachment of the retina; Papillo - retinal infiltration; Deposits in patches upon the retina; Amblyopia and consecutive amaurosis; Sparkling synchisis; soft cataract." The use of homeopathy in the treatment of gastrointestinal conditions in animals. The British Homeopathic Association's website discusses the safety and cost benefit of homeopathy on this page. I’m totally accident-prone and after numerous bumps and bruises, my Dad, a doctor, suggested I visit a homeopath for neck pains and migraines. I immediately noticed a huge difference and from that day on I’ve relied on homeopathy for a whole range of health issues and for general well being too. I use homeopathy to treat everything from early signs of coughs and colds to sports injuries, for myself and my family. I embrace homeopathy as a way of life, visit my homeopath every few months and use a whole host of remedies. Homeopathy has worked wonders for me personally and I cannot deny its effectiveness. As a mother to three teenagers, I have raised my children on homeopathy, using remedies whenever they have been unwell as well as for their general wellbeing. Taking a leaf out of their mother’s book, my children have even been known to lecture the school doctor on the benefits of homeopathy as opposed to traditional medicines such as antibiotics. I was fortunate enough to find homeopathy following the breakdown of my marriage, I’d started to gain weight and was diagnosed with an underactive thyroid. As a result of this I was prescribed thyroxine tablets which are meant to be taken for life. Wanting to avoid this, on the advice of a friend I turned to Dr Sharma, a well-known homeopathic doctor, who was able to provide me with a cure. Since then I have followed a holistic approach to medicine and to everyday life. I am really angry about the way some of the press ridicules homeopathy. Choosing your treatment is a personal thing and the right kind of treatment is different for different sorts of people, so different treatments need to be on offer so that you can make that choice. All I know is without my wonderful son, the love and support of my family and friends, and the homeopathic treatment – I don’t think I could have done it. I was diagnosed with Juvenile Rheumatoid Arthritis (RA) at the age of two and the only treatment that was available in 1986 was steroids. My parents had never heard of homeopathy, but after extensive research, decided that it was a better option than chemical drugs which would have long-term side-effects. Thankfully, they were right. Autoimmune diseases like RA mean your immune system is very low and cannot fight illness. Conventional drugs bring the immune system down even more and along with that, some of them have very strong side-effects. But homeopathy built my immune system back up so that my body could fight the disease. At the age of 17 I came off the homeopathy and tried conventional treatments to beat a bad flare-up. The conventional medicine made the arthritis spread to all my joints and left me in a wheelchair. I went back to homeopathy and eventually got myself walking again. Now, at the age of 28 I’m healthier than ever and I put that down to homeopathy. My two sons and I have taken homeopathic remedies for 26 years. Tom, when he was two, was the first with a Pulsatilla, for a really snotty cold and he has not had an antibiotic from that day to this. Harry was next with Phospherous, for a bad chesty cough. I then joined with a Cal carb, which I used for ‘worn out mother syndrome’! Homeopathy has seen me through coughs, colds, operations, emotional and physical problems both acute and constitutional. But most recently it has eased me through the menopause without having to even think about more toxic medicines. Bless Hahnemann and all that pioneering work he did 200 years ago. The doctors had managed to fix the visible part of my disease with surgery, which means I hardly ever have a day off work now, but living the last 17 years of my life in pain I developed many other issues, mainly mental, that ‘traditional’ doctors were unable/unwilling to help with. The mental issues are as debilitating as the pain, and homeopathy has significantly improved these within a few months and continues to help today: my friends and relatives can confirm I have lost my anger, am more calm and less inclined to fly off the handle. It was amazing … for the first time in my disease’s history someone understood, someone actually ‘got’ what I was experiencing, other than the visible abnormalities in my body. I started using homeopathy over 40 years ago and have relied on it to treat myself and my family ever since. I keep a wide selection of homeopathic remedies on hand at home and use them to treat anything from bruises to throat complaints. Treatments I’ve used over the years, and continue to use, include Arnica, Bryonia, Rhus tox, Aconite, Hypericum, Hepar sulph, Ruta grav, Argent nit and Arum triph. As well as this, I always carry my reference book of homeopathic remedies with me everywhere I go. One treatment which I have found particularly effective is Hypericum and Calendula, which I use regularly to treat my skin. 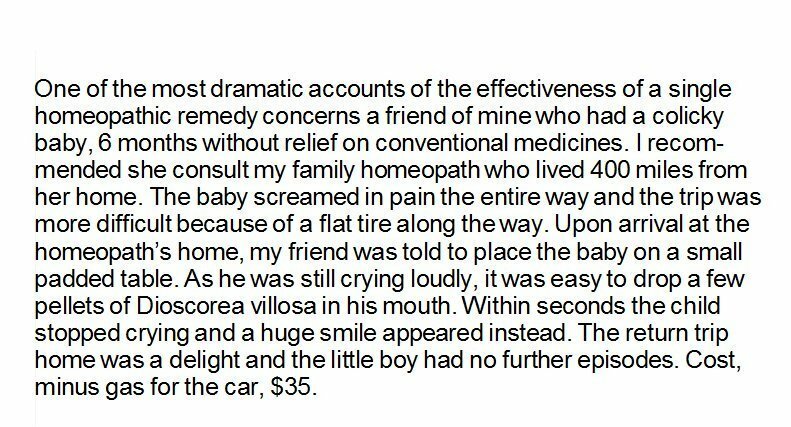 I feel so lucky we were able to get a referral from our GP to the homeopathic doctor. The treatment really does seem to be helping Drew’s eczema and I feel reassured that there are no side-effects and there will be no long-term damage to his skin. I like having the homeopathic medication because it’s natural and since taking it it has made me feel better on the inside as well as the outside. I would describe it as feeling fresh inside. My skin is not as dry and doesn’t feel tight anymore. The eczema has totally cleared from my chest and stomach area and improved from other places. I had Hashimoto’s disease – an underactive thyroid – there were lots of symptoms. I didn’t feel well and had loss of hair and joint pain. It got worse over two or three years and I was referred to the homeopathy clinic in Dalkeith. Within three months the results were almost back to normal, and within six months they were normal. It has remained normal for the last seven years. I’ve used homeopathy for many years and am convinced of its therapeutic value. I first came to know about homeopathy through my son who as a baby suffered from eczema. He had it a couple of years but with conventional treatment the eczema was getting progressively worse and at the age of four he also developed asthma. We turned to homeopathy then out of desperation and were stunned with the positive results. Since then I have used homeopathy for a wide variety of illnesses, but I rely on Arnica as it’s excellent for treating the everyday bruises and shocks to the system we face. My view is that homeopathy and conventional medicines must remain side by side under the NHS to offer the best to patients. I believe that homeopathy should definitely be more widely available on the NHS. In my own experience it has helped when conventional medication hasn’t worked and has been better for me because I react to strong medicines, so I much prefer a more natural, gentler approach. What I can say now is that high dilutions are right. High dilutions of something are not nothing. They are water structures that mimic the original molecules. It’s not pseudo-science. It’s not quackery. These are real phenomena which deserve further study. 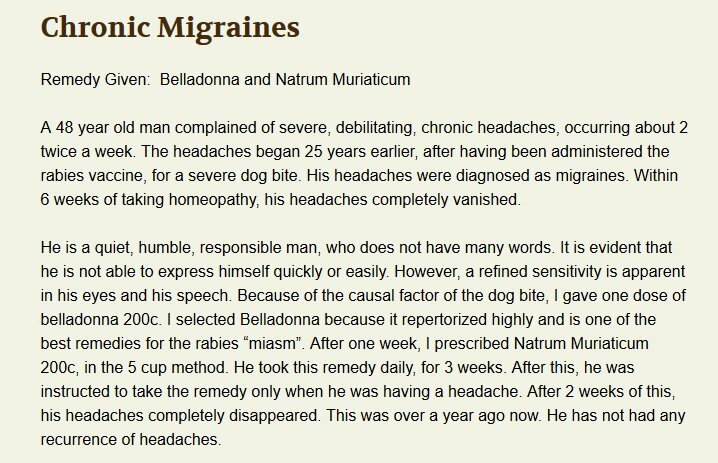 True accounts submitted by people who have been helped by homeopathy. 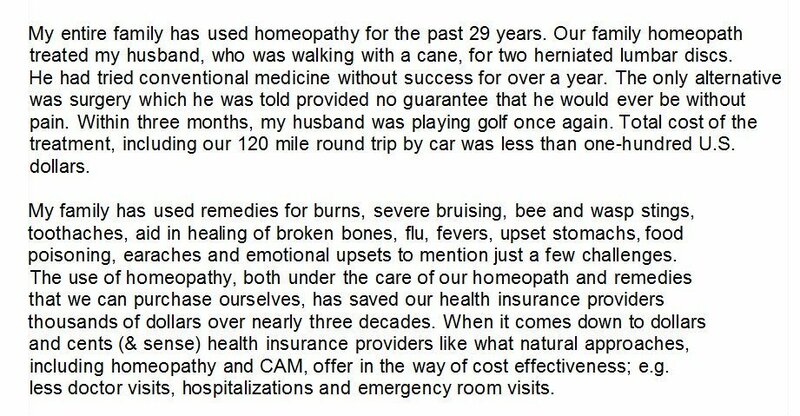 And my own personal testimony: I've used homeopathy with great success for things high blood pressure and high intraocular pressure caused by glaucoma. Having experienced what homeopathy can achieve I would never go back to toxic drugs. Equally great for my animals too.........no more boils, infections, mammary problems after giving birth or other health issues. Thanks ChristyRedd. I just re-posted your URLs as active links. Couldn't agree more with all who benefitted from Homoepathy. My family, my pets, some friends and my self have treated all big and small ailments with Homoeopathy with excellent results, for over 35 yrs. am an amateur, but have a mission to dissuade people from taking allopathic medicines, which poison our bodies to the point of no return.Wish people realise this and use only Homoeopathic remedies. Thank you for sharing your personal successes using homeopathy. It helps overcome the negative view of homeopathy by those who, sadly, don't use it.